Dark Horse has been in charge of the Predator comics pretty much since, well. . .always. But like most other things Dark Horse has been in charge of, the quality of Predator comics swerves from downright fantastic to practically unreadable. What we have here is a 4 issue Predator Mini put out by Dark Horse right in the middle of their Alien/Predator/Star Wars heyday. Let's take a look, shall we? Buddy WIlcox is a passive Vietnam vet holding a secret. . .his father was killed by an alien in front of him during a hunting trip more than 20 years before. Kelly Mathis is a small town girl turned Sheriff who craves action from her boring job. James McCutcheon is a serial killer being transferred to a state mental hospital after being found not guilty by reason of insanity. Their stories begin to come together in the small Oregon town of Fleener Creek during a brutal heat wave. . . This first issue is mostly setup, with the titular Predator only showing up on 3 panels. . .when Buddy Wilcox's father is killed during a hunting trip in 1958, during a flashback, and on the final page. . .officially making this the least Predator-y Predator comic I've read yet. The rest of the comic is pretty much all talking heads, except for a tense standoff and gunfight as the serial killer escapes with two other killers during his transfer. Lack of Predator in a Predator comic aside, the three stories at hand are pretty interesting. 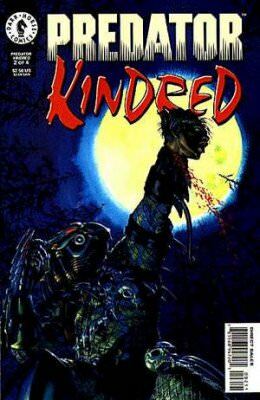 What this comic really reminds me of is if Vertigo did a Predator story. . .lots of talking with just a little taste of action. The art also makes me think of Vertigo comics, with the artist doing an excellent job on faces and facial expressions with fine line work and heavily-inked shadows, but sparse backgrounds where they even exist. . .most of the time the backgrounds are just blank colored spaces. It really sort of reminds me of Peter Snejbjerg's work. Overall, despite the lack of Predator in a Predator comic, a story that's mostly talking heads, and nonexistent (for the most part) background art, I found this opening issue to be low key, but interesting. The alien Predator stalks the forest outside of the small Oregon town of Fleener Creek, killing two escaped criminals and leaving serial killer McCutcheon the only survivor. As the citizens arm themselves and begin to search the forest for the killer, the Predator enters town and kills an abusive husband in front of his wife. First thing, the cover on this issue is fantastic! The cover for the first issue was nicely painted and very detailed, but I've never really liked the Predators without their masks. The cover for this issue shows the alien hunter in full armored glory! I like it a lot. Once again we get a sort of Vertigo version of a Predator story, where the secrets festering under the surface of a seemingly normal small town take center stage and the Predator is sort of a secondary character serving to add tension to existing drama. There's more Predator in this issue than in the first, but that's not to say there's a LOT more. Just enough to spark old memories of killings in 1958 in the townfolk and to remind the reader that there's actually a Predator in the story. The art remains nicely done and adding to the Vertigo-like feel of things. . .especially with a dark fairytale opening dream sequence of Sheriff Mathis that could have been taken straight out of Sandman or Books of Magic. Overall, I can't really decide if I like this strange take on Predator or not. It's interesting, but it just feels off somehow. . .almost like the creative team wanted to tell another story and were using the Predator franchise as a way of being able to do a story about small town secrets. After an abusive husband is brutally murdered, Buddy Wilcox is taken in for questioning, where he reveals his secret to Sheriff Mathews. . .that he witnessed an armored alien kill, behead, and skin his father in 1958. The townfolk form an armed vigilante mob, determined to kill Wilcox, but the Predator attacks the police station, killing several citizens and freeing serial killer McCutcheon from captivity. In the chaos, Buddy Wilcox escapes and his wife discovers him in a secret basement room surrounded by weapons, ready to take revenge on his father's killer. And here's where we start to go off the rails. . . In this run-up to the finale of this strange little series, the focus switches to more action. Unfortunately, the writer's strong point is simmering drama and underlying secrets and things begin to fall apart. The Predator attacking a police station full of people in broad daylight is out of character for a hunter that carefully stalks and kills. His freeing the captive serial killer seems to have no reason except to show that one Predator knows another one. . .a decent concept, but it makes no sense for the Predator to let the killer arm up and waltz away. Then there's Buddy revealing his ultimate secret. . .that he's been hoarding weapons and waiting for the Predator to return. It's a really sharp swerve off the rails and the final full pager of him in boxer shorts with warpainted face and holding a spear is pretty laughable. The art takes a bit of a downward turn with this issue as well. There's another artist on the job for the two last issues, and although their styles are complimentary, it's pretty clear to see that the switch to a more action-oriented final two issues was behind the change. Although their styles are somewhat close, the original artist is clearly the superior of the two on a close look. 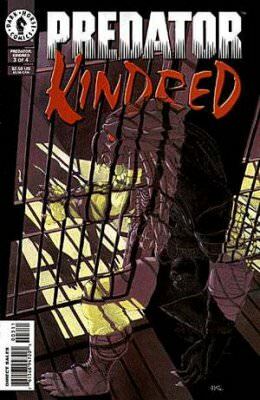 Overall, with this issue Predator: Kindred takes a sharp swerve from Vertigo-style low key storytelling focusing on emotion and underlying secrets to a more action oriented and brutally graphic scenario and the writer has obviously stepped outside his comfort zone. Buddy Wilcox, Sheriff Mathis, Serial Killer James McCutcheon, and the alien Predator all come together in the forest outside of Fleener Creek for a final showdown. . .
First off, another fantastic cover! Unfortunately, what's beneath that cover ain't so great. 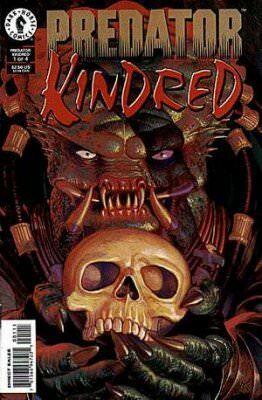 The story abandons all former nuance and this issue is pretty much all fighting and chasing between the main four characters split between Buddy and the Predator battling it out and a cat and mouse chase with McCutcheon and Mathis trying to kill each other. In the end, Buddy abandons his desire for revenge and saves Mathis, killing McCutcheon and allowing the Predator to escape. The art on this issue was pretty bad. I'm led to believe on another look at issue 3 that there were pages that the original artist did layouts on and the second artist did the finishes, because this final issue looks like $hit compared to the previous 3. Overall, this issue wraps up the story and has a great cover, but that's about all the good I can say about it. This Predator mini was definitely a strange bird. It started off really reminding me of the sort of writing and art you would find in Vertigo titles of the time such as Sandman or Books of Magic, focusing less on the Predator and more on the simmering tension and underlying secrets of a small Oregon town. But halfway through, it took a sharp swerve into more typical action comic mode. 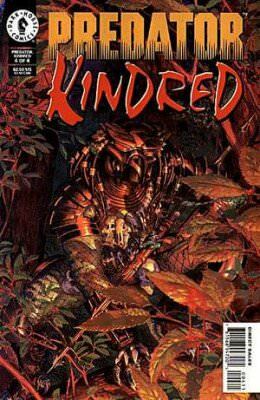 The second half of the series might be more what I expected from a Predator story, but I find myself wondering how it would have gone if the creative team would have stuck with the more low-key storytelling of the first two issues. Overall, this mini actually reads almost like two separate stories. It's not bad. Believe me, Dark Horse put out Predator stuff that's a LOT worse than this, but it's just sort of. . .strange and kind of out of place. Like I said in the review of issue #2, it seems almost like there was another story the creative team WANTED to tell, but they had to settle for telling it through the lens of a Predator story. Another great write-up!! Kindred is going on the want list. Worth it for the covers to #2 and #4 alone! Wish I had a poster of either one.